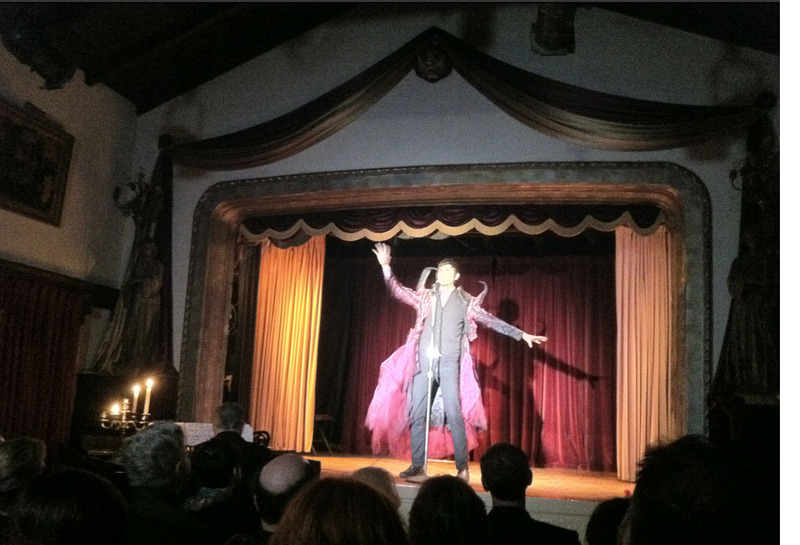 The Magic Castle is one of my all-time favorite places. My introduction was at age 9 when my uncle took me to the all-ages Sunday brunch. Magic you experience as a kid is magic for life. I am still finding hidden corners to explore in that haunted mansion. The Larsen family has run the private club for more than 50 years, and they are strict about rules and regulations. A guest pass from a member is a rare and special treat and not come upon easily. If I was excited to visit the castle, I was nearly apoplectic when I received an invite to Brookledge, the private theater behind the Larsen family home in Hancock Park. Magic trick manufacturer Floyd Thayer built the hall in 1929 and used it to show off his new products. The Larsen family has owned the property for more than 70 years but the room has been dark for much of that time. In 2009 Erika Larsen revived the theater, programming magic, music, and variety arts for a group of invited guests. Erika is Vice President of the Academy of Magical Arts and former editor of Genii magazine; she is passionate about this world, and the incredible community of artists she has gathered. The fantastical auditorium and the lush jungle around it are extraordinary but private. A seat in the audience is by invitation only. Now you have a chance to be admitted into this secret garden. Erika has launched a Kickstarter campaign to replace some of the worn out stage equipment and is offering a bounty of rewards to backers, including tickets to her 2014 season of the Brookledge Follies. Wouldn’t that be the perfect gift for that person in your life who loves classic entertainment? Many have attempted to revive Vaudeville-style shows like this, but nothing comes close to the stunning array of incredible artists here: from opera, to sword swallowing, to the Bob Baker Marionettes. The campaign’s website quotes Brookledge regular Paul Reubens, who calls it “A place you can hardly believe exists. A fairy tale come to life… ” I couldn’t agree more.